KeenFinder.com is the PUP that uses misleading techniques to prevent removal. Use Reimage to locate malicious components and get rid of them faster than with uninstall instructions. A full system scan blocks virus reappearance and prevents traffic to malicious domains. KeenFinder.com virus is a highly suspicious freeware variant that continuously serves sponsored content to the user. It is classified as a browser hijacker[en-1] that usually arrives at the target system as a Keenfinder Desktop Search app and starts controlling victim’s web browser settings right away. Once installed, it hijacks normal web browsers such as Chrome, Firefox or IE and starts causing URL redirections in them. Affected web browsers will automatically open hxxp:/keenfinder.com/ as default start page and also deliver results brought by this search tool everytime the user enters a search query into the web address bar or mistypes a website’s address. Such changes can seem annoying, especially if you loved the previously used search engine. To roll back altered settings, remove KeenFinder.com using an anti-spyware or anti-malware program, for instance, Reimage. 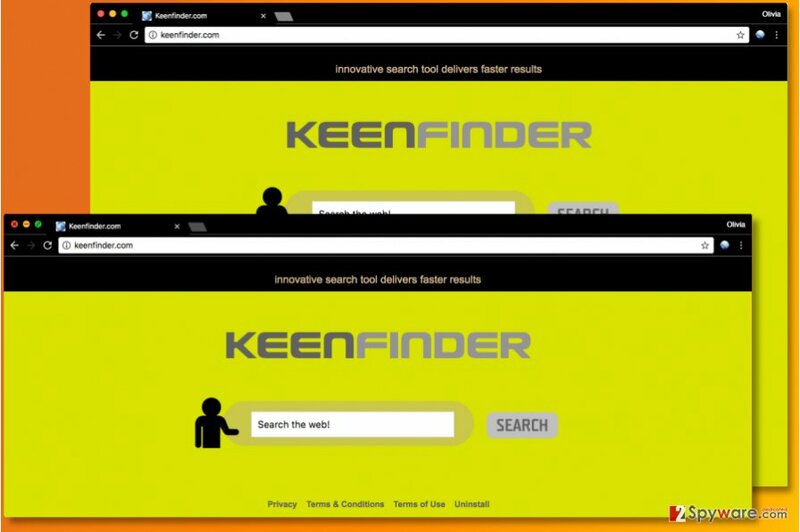 The aim of KeenFinder redirect virus is to provide sponsored content to you along with organic search results. Such search engines are not the ones that deserve your trust. You can easily get into a dangerous website when looking for information that you need, but the developer of this suspicious search tool suggests “evaluating and bearing all risks associated with the viewing or use on any such content or services,” and disclaims liability for such content and services. Therefore, if you ever enter a shady web page through KeenFinder search results, better quit it immediately. If you care about your privacy, you should implement KeenFinder.com removal ASAP as well. It turns out that the suspicious browser hijacker silently collects non-personally identifiable information, including user’s IP address, type of browser and OS, search queries and browsing history. The hijacker admits sharing such data with third-parties such as Yahoo!, AskJeeves.com, Miva, and others. Considering how many data breaches Yahoo! has experienced, we do not think that you should be using its services at all, and the same can be said about companies that collaborate with it. Therefore, you might want to change your preferences right now. Before you do so, you must eliminate the hijacker from your computer system. Researcher points at KeenFinder.com search engine that is promoted by various potentially unwanted programs. Once such program hijacks victim's browser, it becomes hard or nearly impossible to modify homepage and default search settings. Keen Finder hijack occurs when the user inattentively downloads and installs a free program to the system. The developer of this potentially unwanted program admits that its product can be offered to users when installing software bundles. Software packages usually look like individual programs, however, only until you inspect their installation wizards. These tend to hide information about extra programs in Default or Standard settings, which are offered as default installation options. When trying to avoid potentially unwanted programs, you should prioritize Custom or Advanced options, which allow to actually see the list of bundled additions and reject the unwanted ones. It is easy to remove KeenFinder.com virus if you have an anti-spyware software, however, if you do not have it yet, there are two options you can choose from. 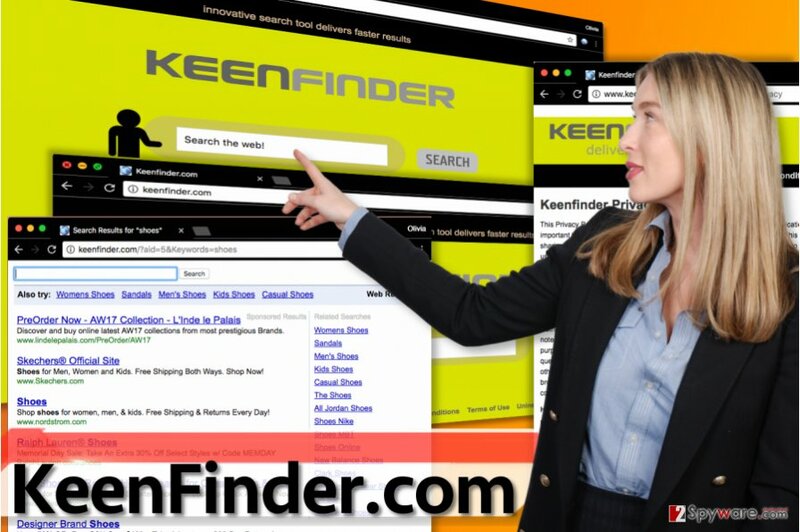 You can either select a program that looks best to you and use it for KeenFinder.com removal, or you can rely on instructions provided by 2-Spyware experts and eliminate the browser hijacker manually. The first option is much safer and less time-consuming one; however, the second one works just as good if you follow the provided guidelines carefully. Choose whichever option looks the best to you and start deleting potentially dangerous components from the system right away. Find and uninstall Keen Finder Desktop software by following these instructions. Here, look for KeenFinder.com or any other recently installed suspicious programs. Wait until you see Applications folder and look for KeenFinder.com or any other suspicious programs on it. Now right click on every of such entries and select Move to Trash. When in the new window, check Delete personal settings and select Reset again to complete KeenFinder.com removal. Once these steps are finished, KeenFinder.com should be removed from your Microsoft Edge browser. Refresh Firefox using the following tutorial. Here, select KeenFinder.com and other questionable plugins. Click Remove to delete these entries. Now you will see Reset Firefox to its default state message with Reset Firefox button. Click this button for several times and complete KeenFinder.com removal. Delete every browser extension that was added to your browser without your knowledge or authorization. Here, select KeenFinder.com and other malicious plugins and select trash icon to delete these entries. Click Reset to confirm this action and complete KeenFinder.com removal. Here, select Extensions and look for KeenFinder.com or other suspicious entries. Click on the Uninstall button to get rid each of them. Here, look at the Homepage field. If it was altered by KeenFinder.com, remove unwanted link and enter the one that you want to use for your searches. Remember to include the "http://" before typing in the address of the page. Now you will see a detailed dialog window filled with reset options. All of those options are usually checked, but you can specify which of them you want to reset. Click the Reset button to complete KeenFinder.com removal process. This entry was posted on 2017-05-29 at 06:00 and is filed under Stealing programs, Viruses. You can quickly scan the QR code with your mobile device and have KeenFinder.com virus manual removal instructions right in your pocket. How did you remove KeenFinder.com virus?